The tin box caught my eye; bravely perched atop piles of garbage, discarded clothing and broken furniture. It was old, probably 50’s or 60’s, a bread box in it’s day; the kind of box that sat on your grandmother’s kitchen counter. Discarded behind a derelict house; tossed out in haste or aggression, left to fend for itself in the driving rain. My fondness for vintage nick knacks brought the car to a stop, I tossed it into the trunk with nary a thought to the contents or owner. I hadn’t noticed the weight of abandoned tin box, it didn’t occur to me to look inside . I confess it lay forgotten, weeks passed before remembering to take a look, what I discovered broke my heart – I had become the caretaker of another’s life. This wasn’t something a person discarded when cleaning out the closet or packing for a move. Tin box protected a family history; decades of photographs and letters – smiling faces of those who have come and gone, birthday cards, best wishes lacking any hint of origin. Familiar words intended for those who had no use for envelopes with return addresses or last names. A tin guardian lost forever. Tin box rests undisturbed in my basement; I’ve pondered long and hard how it ended up in that alley, asked myself if someone came looking for it, and agonized over my rash decision to toss it in the car. Tin box refuses to reveal a single clue as to where it came from, who might be missing it or how I can return it safely to anyone who cares. I suspect the demise of tin box was ugly – likely a casualty of circumstance – testament to a life gone astray. In my heart I know tin box would have gone to the dump had I not thrown it in my trunk. I understand lives fallen off the rails, tin boxes the least of your worries. 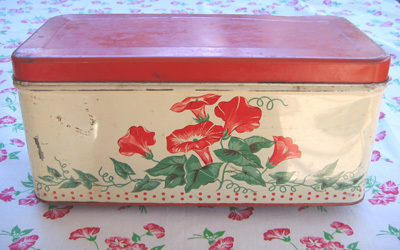 All the same – my sincerest apology tin box, I had no idea how valuable you were. I’ll keep you safe and warm and promise not to use you as a flower pot. My hope your owner has their life together is sincere, your treasure testament to a once happy family – a family that loved the one who saw you languish in that dark, forlorn alley.